This table top kiln gives you great flexibility as the generous firing chamber will let you do a load of jewelry, fit a Colour de Verre Mold or let you slump items up to 7x7". Keep an eye on your work as it fires with the window in the lid. No more getting out the gloves and tipping the lid up, letting the heat escape. 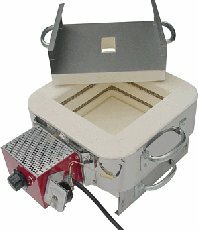 This kiln is a great seller and even large studios will use it for test firing or working on smaller projects. Comes with pyrometer and infinite switch control. Runs on standard house current, 120 volts. Draws 1440 watts, about the same as a toaster oven. Has standard three prong plug. 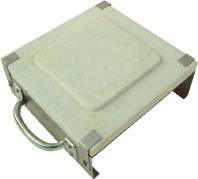 240 volt versions are available as special orders at additional cost. Please call or e-mail for details. Delivered to your door via UPS. This item works as either a lid or a bottom should you damage yours. Does NOT have a window.